-Canal Commercial Trust and Savings Bank was formed in 1924 as a merger between Canal Bank (formed in 1831) and Citizens Bank of Louisiana (formed in 1833). Canal Commercial Savings Bank and Trust was largely secured by sugar-cane holdings. 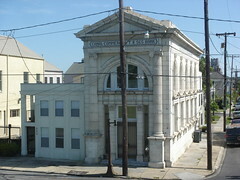 The bank ultimately failed in 1933 and was liquidated, with its assets becoming part of The National Bank of Commerce in New Orleans – later known as First NBC.